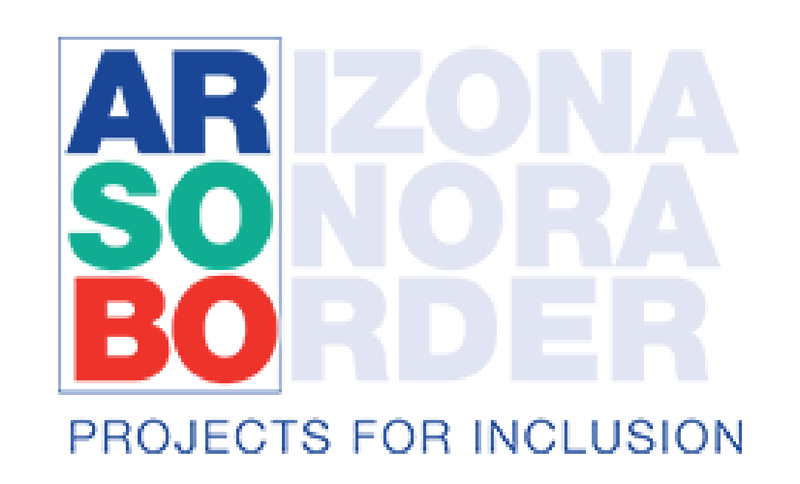 The CACTI (Community Advisory Council & Trainee Infoshare) is the Sonoran UCEDD's blog featuring the voices of our interdisciplinary trainees and Community Advisory Council (CAC) members as they highlight diverse images of people with disabilities and provide community information and advocacy on disability issues. 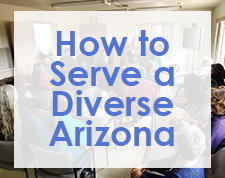 The Sonoran UCEDD recognizes the need for diverse stories, images, and viewpoints to raise public awareness and increase understanding in Arizona of people with developmental and other disabilities, their strengths, talents, and challenges. We hope you find The CACTI useful and informative. To set up an RSS feed and subscribe to the CACTI, click on the icon at the bottom of the page. By subscribing to this feed, you receive updates when a new post publishes. I am a UA PhD candidate in anthropology and Sonoran UCEDD (SUCEDD) Diversity Fellow. My research focuses on the social aspects of Traumatic Brain Injury (TBI), a common yet largely misunderstood injury sustained by nearly 2.8 million Americans every year, according to the latest figures from the CDC. It is also one of the largest causes of death and permanent disability for those under 65 in the contemporary US, even though many TBI survivors show little to no outward signs of they impairments. My dissertation on "The Social Life of TBI" teases out the social impact and construction of these injuries, as survivors and those around them live the rest of their lives affected by them. interpersonal issues related to each of these. Every day, I personally experienced and recorded how these impairments interacted with my work in the field. I noted these interactions on field notes covering narrative and semi-structured interviews with survivors, their friends and families, and local policymakers, weekly TBI Support Groups, and at formal and informal community events. I also kept a field journal where I reflected on the role my injury plays in my development as an anthropologist. Additionally, during this time, my project team at SUCEDD conducted monthly conference calls, during which I inform the team of my progress and help introduce them to social angles on TBI that they could use in their own projects in Arizona. As part of the fellowship, I participated in the Association of University Centers on Disabilities (AUCD) learning community for Diversity Fellows across the UCEDD network, and was an active member of the learning community’s policy sub-group. I tried to bring in my background as a Master of Public Administration (MPA) and my work with non-profit health organizations to discuss various disability policy-related issues. My specific interests for this sector are in the intersection of disability and public health policy, as well as TBI survivors’ workplace and employment concerns (whether or not they identify as disabled and make use of ADA-guaranteed accommodations). Ultimately, I hope to use my fellowship experience along with my dissertation to begin to spread awareness of the reality of TBI and all brain injuries on individuals, families, and communities. I am especially targeting it at local policymakers, as my research has found that they have enormous potential to mitigate the injury's most harmful social effects on survivors and those around them, including on the extremely high correlation between TBI and homelessness now being discovered in homeless populations throughout major US cities. I had the opportunity to attend the 2017 Association for University Centers on Disabilities (AUCD) Conference in Washington, D.C. from November 5-8. Attending the AUCD conference was an incredible experience that gave me a new sense of confidence and left me even more committed to serving individuals with disabilities. Leading up to the conference, it was difficult to focus on anything other than preparing for my first poster presentation. I knew that I would be entering a space filled with leaders in the disability field, each equipped with years of professional and research experience that I was just beginning to build. However, as soon as I began sharing my own work on Person-centered Planning for foster youth with IDD, my feelings of nervousness were replaced with excitement. One after another, conference attendees took the time to stop and listen to the information I was sharing, genuinely engaged and interested in my work with the Sonoran UCEDD. 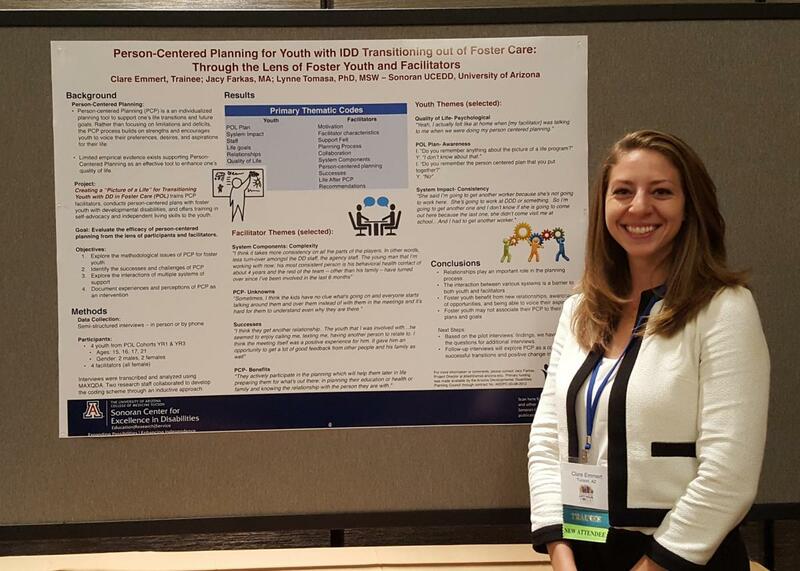 Perhaps the most rewarding aspect of the AUCD conference was this opportunity to connect with others face to face, exchanging stories and building rich conversation around the importance of Person-centered Planning and other tools that could improve the lived disability experience. Throughout the remainder of the weekend, I found myself continually inspired by other attendees, eager to continue these conversations around their work, values, and ideas for change. I still think back to the community that was cultivated by the AUCD 2017 conference, and am so grateful to have been a small part of that. As I reflect on my conference experience, one session helped to re-shape my beliefs around self-advocacy and the important role information accessibility plays in advocacy, independence and inclusion of people with intellectual disabilities. The concurrent session, “Accessibility is Much More than a Checkbox: Making Sure People with Intellectual Disabilities Can Truly Access Resources and Programs Independently,” addressed the importance of people with intellectual disabilities (ID) being able to access material on their own by highlighting AUCD’s “Tuesdays with Liz: Disability Policy for All,” the Autistic Self Advocacy Network (ASAN)’s Medicaid toolkit, and the Human Development Institute (HDI)’s KentuckyWorks website. The session, led by long-time disability advocate, Liz Weintraub, and ASAN and HDI staff, demonstrated that accessibility also includes respectfully presenting information using multiple tools, learning devices, audience reviews, and clean formats. In sharing these resources and teaching others how to ensure information is accessible, the panel promoted inclusion of people with ID in multiple contexts. Although the presentation content focused on designing accessible materials like websites and brochures, the speakers assured attendees that the strategies could apply to anyone who interacts with an individual with ID. For example, if one is sending an email or facilitating a meeting with a person with ID, the guidelines for ensuring the content is presented in an accessible format are equally applicable and important. For individuals with ID, it can be incredibly difficult to sift through lengthy documents ripe with academic language and absent of visuals or other supports. The session leaders reminded the audience that one should never simply omit information in order to make the process of creating an accessible format more feasible. While the accessible format can be lengthy and time-consuming to create, they encouraged attendees to think about information accessibility early on, incorporating funding for the process into their grants. All people should have equal access to information; it is crucial that individuals with ID have access to the same information that individuals without disabilities do, especially when it pertains to policies that affect their quality of life. Unfortunately, it is not common in our culture to see individuals with intellectual disabilities in leadership positions, and often the policies that affect individuals with intellectual disabilities are discussed without involving the input of a self-advocate. Perhaps if our social and cultural constructs around intellectual disability were less stigmatized and more rooted in the value of this diverse population, organizations and leaders would already ensure that the materials they produce are universally designed. Prior to this session, I viewed self-advocacy as something an individual is responsible for pursuing themselves. That is, if someone does not pursue the role of self-advocate, it must be because they simply don’t want to be. However, I now realize that this frame of mind is incomplete. While self-advocacy is a personal choice that cannot be forced upon someone, I had never considered that not everyone has equal access to becoming a self-advocate. I appreciated the way this session shed light on the environmental barriers that prevent individuals with intellectual disabilities from becoming self-advocates, and feel that our communities can take on more responsibilities to ensure the information they disseminate is accessible to diverse populations. Individuals and organizations who prioritize information accessibility show that they value the input of individuals with intellectual disabilities, ultimately increasing opportunities for individuals with disabilities to lift their voices. 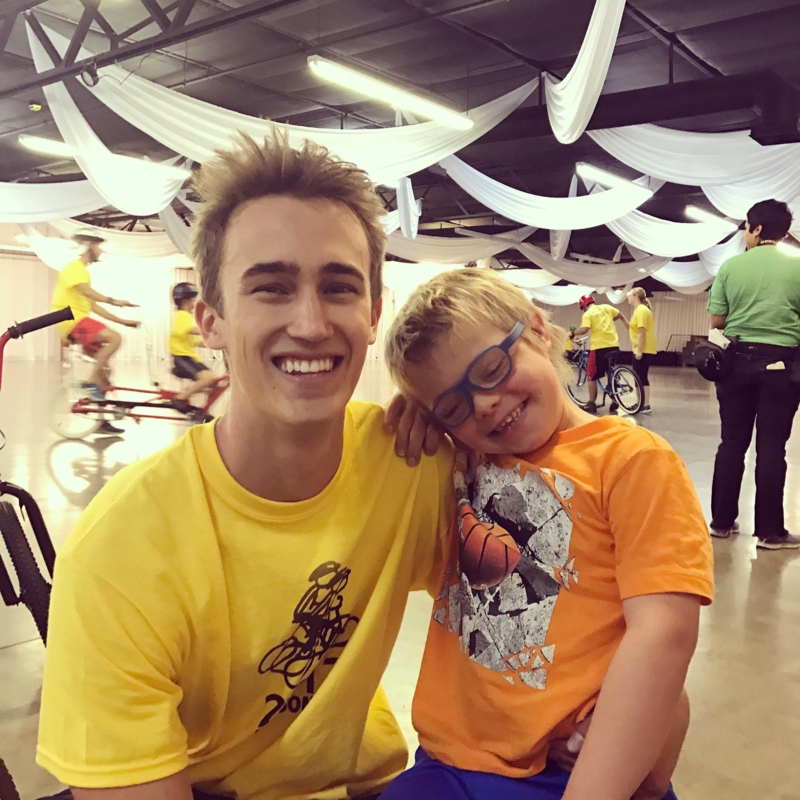 Sonoran UCEDD interdisciplinary trainee, CJ Bruske, shares his volunteer experience with iCan Bike Camp put on by iCan Shine, Inc. and sponsored by the Southern Arizona Network for Down Syndrome (SANDS) as part of his community reflections portfolio for our undergraduate certificate in developmental disabilities. I decided to get started on the portfolio aspect of the certificate pretty quickly as I found myself in Tucson for the summer. I had somewhat ironically just gotten back from mountain biking with my roommate, when I received an email about the iCan Bike Camp. It felt like fate as I had just gotten back from enjoying one of my favorite activities, and I couldn’t pass up the opportunity to help children with Down syndrome also experience one of the great joys in life. After orientation, I still felt very unprepared in assisting the riders to successfully control their bikes. I remembered my own experience learning to ride a bike and the struggle of falling down over, over, and over again. When I first arrived to the first of five days, I was met with eager families that had already arrived thirty minutes early. The apprehension I had about bikes was relieved when I observed the rollers on the back on the bike and the way they prevented the kids from falling off while learning. I was introduced to my rider, Bentley, who immediately wanted to hop on the bike and could not have cared less about who was going to help him. I luckily had worn my athletic shoes, as I immediately learned how hard it is to run next to a bike when your rider is as eager as Bentley was. Quickly, his bike was called into the “shop” to get fixed up (his bike’s roller was replaced with a more narrow one which was not revealed to the riders to prevent any apprehension about less balance). In the meantime, Bentley got a water break and danced to his favorite song that he requested to be played every day at least five times. All of the riders did not have such immediate success as Bentley did. Some of them were on their bikes at least by the end of the first day with their feet on the pedals, but one rider specifically was unable to get their feet on the pedals until the third day without screaming. Every family member that was there supported each rider; with each lap around the warehouse, every rider was met with cheers and words of encouragement. Even though every child was on a different level, there was a sense that everyone was working towards the same goal, which created the positive environment necessary for every rider to be successful. As the week progressed, Bentley was able to ride his own bike that had been brought from home, which he had been eagerly awaiting. The only issue was that the day prior, he had his first serious spill. He was on a regular bike with just a handle bar for me to assist while he rode and had taken a turn too confidently. As I had been taught, I started to compliment how awesome of a fall it was, making sure he didn’t sense that I was secretly freaking out inside. He got right back on the bike, but I could tell he wasn’t the same. Because of this, the last day was the most difficult one, as he constantly would call for me to hold onto him. Luckily with determination and some tough love from his mother, we worked through it and by the end of the day, he had to be pulled off of the bike to go home. This camp was valuable to the riders because each one of them left with a greater sense of self-confidence and understanding of their abilities. The radiant smiles on their faces when a medal was bestowed upon them showed just how much the camp had meant to them. For those with disabilities, especially in their younger years, it is crucial that they believe they are able to participate in what other kids their age do. Riding a bike is a milestone in every child’s life, and iCan Bike ensured that all of the riders were able to as well. The amount of tears that were shed by parents watching their children succeed at riding a bike also proved how impactful the week was for the families. For Bentley, he was able to finally ride around with his siblings and not feel left out anymore. His mother no longer had to tell him that he had to use his training wheels and he took a great step in gaining his own independence. It was an amazing week in that I feel like so much was accomplished in just five one hour and a half days. I have a new friend in Bentley, and a new understanding of the challenges that those who have disabilities face while growing up. As the week went on, I know we had made a connection, as he trusted me enough to bike without me constantly behind him. I felt blessed to share the moment with his family for the week, and even was offered to come over and ride bikes at their home. I also learned that his father is a pediatric doctor that specializes in kids with disabilities, and that I was welcome to talk to him about his career path whenever I wanted. I also was able to make it into the Tucson news and be featured in pictures with Bentley. His outgoing nature immediately stole the show and the best of him came out when the camera was on him. Thanks to the Sonoran UCEDD for sponsoring me to attend the National Task Group on Intellectual Disabilities and Dementia Practices train the trainer workshop on Fundamentals of Intellectual Disability and Dementia. 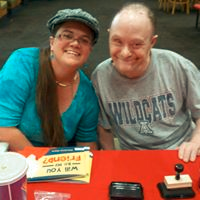 As a sibling and guardian to my oldest brother, Joey, who is 57 and diagnosed with Down Syndrome, I plan to pass along the wealth of information and personal experience by collaborating with the UCEDD for trainings across the state to inform families and professionals working with aging individuals with ID. I have been fortunate already to train my brother's current staff with some tidbits learned, and it is proving to be beneficial for the staff and residents. Thank you Sonoran UCEDD for taking the aging issue seriously and doing something about it. Being a sibling caregiver can carry many roles - one which is called the sandwich generation. Where we caregive for our sibling at the same time we begin caring for our aging parents. You will find planning ahead and surrounding yourself with support will help you have a healthier transition. The old adage that you have to take care of yourself in order to take care of others is true. Reach out and find resources...don't take no as an answer. Find someone who will help you keep others accountable, as well as help you relax. If you are looking for support in aging and DD, a great place to start is our local Alzheimer's Association Desert Chapter, which has a great program for caregivers called CarePro to help teach and support family members. Another great resource if you are a sibling is Sibnet or go to the Sibnet Facebook group and ask to join (it is a closed group for privacy reasons). Finally, your local Area Council on Aging (Pima Council on Aging in Tucson) is a huge resource as well. Don't be afraid to ask for help and keep asking until you find what you need. Persistance is key. Joey is an integral part of my life. He has taught me more than any teacher, training, agency or program ever will. Even when it is hard to handle the truth and the future, his smile and hugs always brighten the day! Follow our facebook page - Joey's Ups with Downs - as we share Joey's life and my own as a co-guardian to show the importance of family/sib roles in the life of a person with a disability. According to the Spina Bifida Association of America, Spina Bifida is “the most common permanently disabling birth defect in the United States.” The disability is a neural tube defect, where the spine of the baby in the womb does not completely close. That is where the name “Spina Bifida” originates, as the name means “Open Spine” or “Cleft Spine.” There are four types, with the most severe being Myelomeningocele. With this form, surgery is required at birth; this prevents infection and keeps the spine safe. This is the kind I have, and I also have hydrocephalus (literally “water on the brain”), which requires a shunt to help regulate the flow of cerebrospinal fluid. For me, Spina Bifida affects certain functions in my daily routine. I also try hard to keep on top of my health, and doing this requires me to adapt daily. As there are different types of Spina Bifida, not all are alike, and everyone can have different individual needs. I have heard the term “Snowflake Disability” used to describe how no two people with Spina Bifida are the same. For example, some people are able to walk, and some are not. This is one reason why there needs to be more awareness of Spina Bifida; people need to know that one size does not fit all when it comes to the disability. As it stands now, there does not seem to be enough awareness of Spina Bifida. Also, the Arizona Department of Economic Security – Division of Developmental Disabilities (DDD) does not include Spina Bifida as a qualifying developmental disability in order to obtain services. To include people with Spina Bifida in the DDD services system would require a legislative change. Adding Spina Bifida to the list would mean people with Spina Bifida could obtain services, such as therapies, through the DDD service system. Currently, people with Spina Bifida can explore available resources through their own doctors and insurance plans, or they can find out more options through the Arizona chapter of the Spina Bifida Association. There are also services that can be found through Children’s Rehabilitative Services (CRS). The website for DDD also includes a link to Arizona 2-1-1, for people who do not fit within their eligibility requirements. Here, people can browse their extensive listings and explore available resources for various disabilities. This directory can be found at http://www.cir.org. For more information visit Spina Bifida Association’s website, http://spinabifidaassociation.org/what-is-sb/, as well as the local chapter’s website, at www.sbaaz.org.